What is my risk for Cancer? Cancers can be inherited from either the mother’s or father’s side of the family. Certain types of cancer are more common in specific ethnic backgrounds, especially Ashkenazi Jewish descent with Hereditary Breast and Ovarian Cancer. Based on your family history of cancers (specifically breast, ovarian, endometrial/uterine and colon cancer) you may be in need of diagnostic test that will determine your risk for hereditary cancer syndromes. This test result may better direct medical management decisions to reduce your cancer risk. The Women’s Group of Northwestern offers Myriad myRisk™ Hereditary Cancer is a 25-gene panel that identifies an elevated risk for seven important female cancers, including breast, ovarian, gastric, colorectal, pancreatic, melanoma and endometrial. This test will better allow your provider to personalize your medical management and help us to make important decisions together to reduce your cancer risk. Myriad myRisk™ Hereditary Cancer is a scientific advancement revolutionizing hereditary cancer testing. 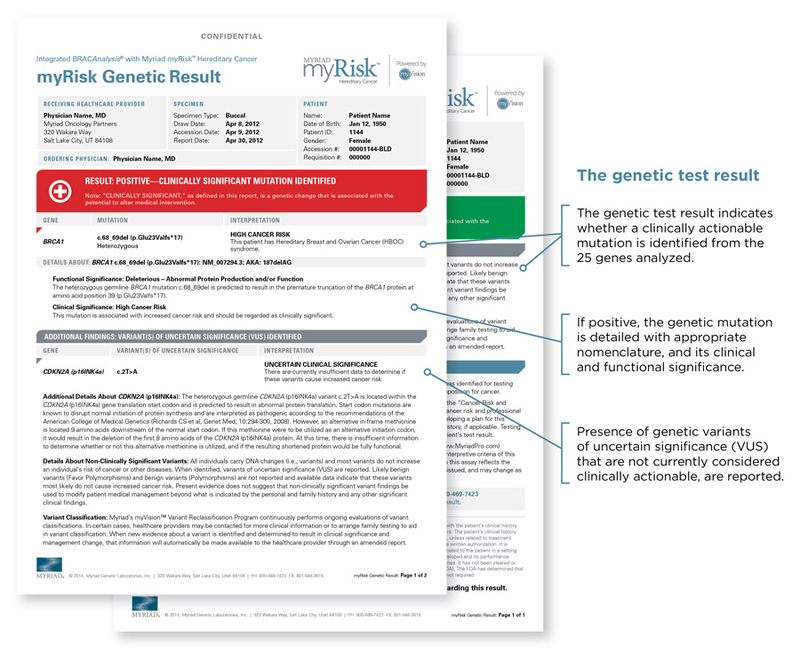 Blending both genetic test status AND personal cancer family history, Myriad myRisk represents the next generation of hereditary cancer risk testing. 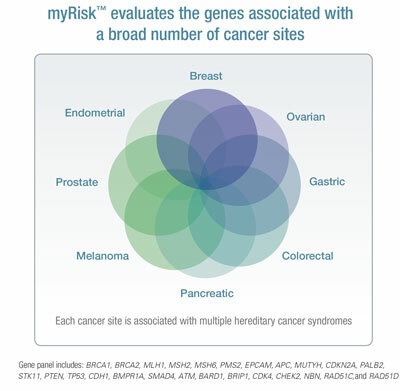 Myriad myRisk identifies elevated risk for 8 important cancers by analyzing multiple, clinically actionable genes. Additionally, Myriad myRisk provides a summary of available medical society guidelines to help you optimize your medical management.